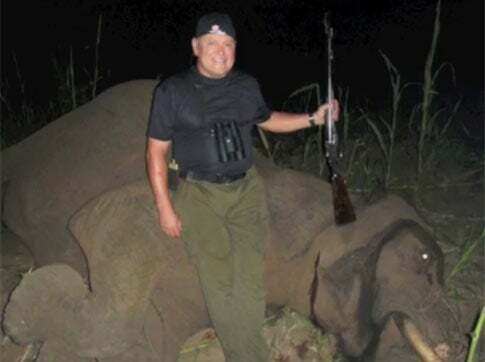 Seemingly confirming suspicions that publicity is never far from his thoughts, Bob Parsons is mounting a media blitz to defend his elephant-hunting habit. The unapologetic man's man and CEO of GoDaddy, which is by far the world's largest domain-name registrar, sparked a fresh controversy this week after posting a video of himself shooting and killing a bull elephant in Africa. The video shows Parsons and a few other hunters night-stalking a herd of "problem" elephants that had allegedly been trampling the crops of locals in Zimbabwe. With the footage set to a soundtrack from AC/DC, Parsons downs a bull and poses for photos next to the dead elephant. The video then shifts to show a chaotic mob of locals butchering (presumably) the same animal. Parsons uploaded the video a few weeks ago, and has also shared videos from hunts in past years, but only this week did it create irritation in the blogosphere. Not surprisingly, People for the Ethical Treatment of Animals (PETA) condemned the video, named Parsons its "Scummiest CEO of the Year" and announced that it would be cancelling its account with GoDaddy for Web services. Competitor NameCheap.com took a different tack, capitalizing on the controversy by offering domain transfers for $4.99, with a portion of the proceeds going to the charity Save the Elephants. "Over 10 nat'l interviews today. Will be on news tonight. Love explaining why it's a good thing to help starving people." I spend a few weeks in Zimbabwe each year helping the farmers deal with problem elephants. The people there have very little, many die each year from starvation and one of the problems they have is the elephants, of which there are thousands and thousands, that trash many of their fields destroying the crops. The tribal authorities request that I and others like me, patrol the fields before and during the harvest -- we can't cover them all, there are just a few of us -- and drive the elephant from the fields. The farmers try to run the elephants away by cracking whips, beating drums and lighting fires. All of this is ignored by the elephants. When my team catch elephants in a field (there are never just one) we typically kill one of them and the rest leave for good. After we kill an elephant the people butcher the elephant and it feeds a number of villages. These people have literally nothing and when an elephant is killed it's a big event for them, they are going to be able to eat some protein. This is no different than you or I eating beef. If at all possible we avoid elephant cows and only kill mature bulls. By just killing bulls it has no effect on the elephant social structure (as it is matriarchal) as well as the herd size. The reason is another bull quickly steps up and breeds in place of the bull taken. PETA and other groups claim there are a plethora of non-lethal methods to keep elephants out of crops - everything from chili-infused string and beehives on poles to simply banging together bamboo poles - and at least one group considers African elephants to be "threatened," although their status can vary widely across their range.